The Villa Casa Marbena is a very luxurious and cozy place to vacation with a spacious garden and private pool. You can live in this private accommodation with up to 8 people. From the house you have a stunning view of the sea and the bay of Palma. The town of Bendinat is a small but luxurious place located between the Tramuntana mountains and the sea. Furthermore, in Bendinat the beautiful bay of Cala Bendinat, which represents an oasis of peace. 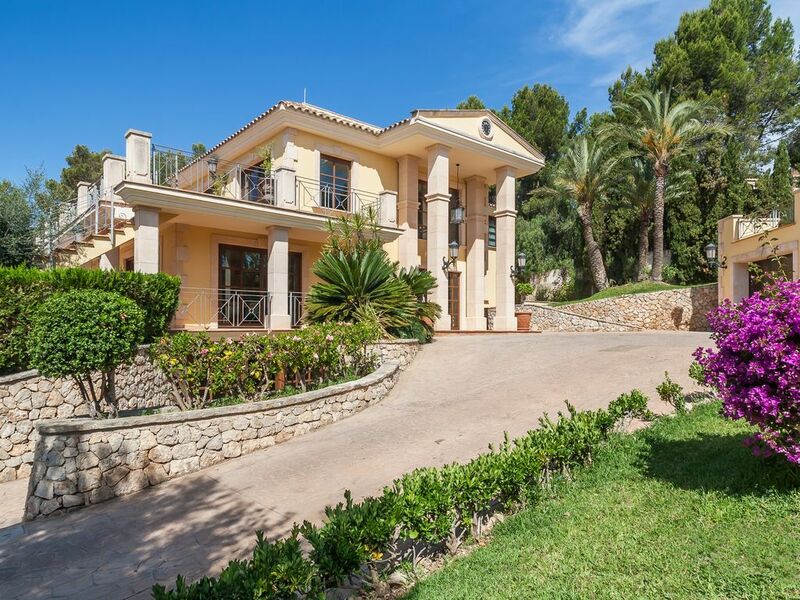 The villa is located in a privileged and quiet residential area in Cas Catalá on the border with Bendinat and stands on a 2000m² plot with a living area of ​​500m². The villa, which was renovated and remodeled in 2017, has a spacious entrance hall, a living room, a dining room, a modern high quality kitchen, a utility room, 4 bedrooms and 4 bathrooms. All bedrooms have air conditioning, quality mattresses, blankets and covers and are equipped with flat screen TVs. The dining room is furnished with a rustic wooden table that will fit the whole family. In the spacious kitchen are all necessary utensils for a good meal available. Outside there is a private pool including Jacuzzi with stunning sea views. In the colder months, the pool (and the jacuzzi) is heated by the house heating and can be heated up to 30 degrees. Between the pool and the house there is a spacious terrace landscape which offers beside 10 couches also place for tables and a pavilion. There is also a barbecue area. Due to the nature of the garden and the existing planting the entire pool area from the outside and from the direct neighbors is not visible. From the 70m ² terrace on the first floor you can enjoy the 120 degree sea view on the bay of Palma. Das Haus besticht durch klar durchdachte Innenarchiterktur, Design UND Pragmatismus. Top eingerichtet findet man alle Gegenstände wo sie vermutet werden. Der Vermieter hat an alles gedacht inklusive einer hervorragenden Bedienungsanleitung für Haus und Umgebung. Absolut empfehlenswert!